Jeeraga Kuzhambu is a very flavorful kuzhambu prepared with cumin seeds and garlic. It is more or less similar to the regular South Indian kuzhambu but with a nice aroma and flavor of cumin seeds. This kuzhambu goes well as an accompaniment with rice and even with idli, dosa and ven pongal. It can be stored for more than 10 days in the refrigerator. It needs very less ingredients and is very easy to prepare. Today we will learn how to make Jeeraga kuzhambu following this easy recipe with step wise pictures. Peel garlic and keep it ready. Check out How to peel garlic easily. Soak tamarind in 1 cup of hot water for 15-20 minutes. Extract the juice, add another cup of water and extract more tamarind juice. Discard the pulp. Now we have 2 cups of tamarind extract. Keep this ready. Dry roast cumin seeds until you get a nice aroma. Once it cools, powder it and keep it aside. 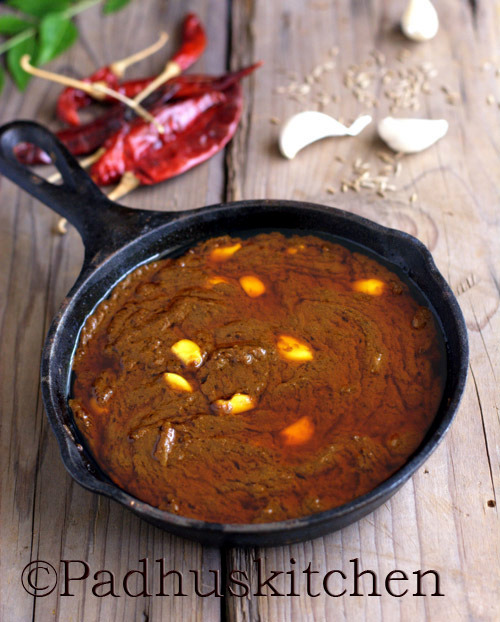 Heat oil in a kadai, add garlic and saute for 2-3 minutes. Add tamarind extract, sambar powder, turmeric powder and salt needed. Mix well. Boil on medium heat until the kuzhambu thickens. Stir in between. (you can see the difference between both the pictures below - in the first picture - tamarind extract has just been added, in the second it has thickened). Once the kuzhambu thickens, add cumin seed powder, mix well and boil for another 2-3 seconds. Add a tbsp of sesame seed oil and switch it off. Enjoy it with hot rice topped with sesame seed oil. Note - I used my homemade sambar powder (which is less spicy) for making this jeeraka kulambu. If using store bought sambar powder, add less or according to the spice level. Some store bought sambar powder are too spicy and hot. I used rock salt. If using table salt, add a little less or as required. Use old tamarind and sesame seed oil (nallennai) for all kuzhambu recipes for best results. Shelf life and Storage - This kulambu stays good for 2-3 days at room temperature and for nearly 10-15 days in the refrigerator. If you are not going to store for a longer period, you can skip that 1 tbsp gingelly/sesame seed oil which is added at the end. Store it in any stainless steel dabba with lid. Super recipe. I will definitely try it out.